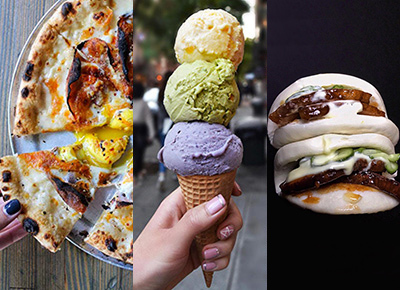 Between truffle bagels and boozy snow cones, this city is constantly coming up with madcap creations to excite the hungry masses. But there’s one old-school formula that never fails: the cozy neighborhood wine bar. For date night, girls’ night or a solo post-work Malbec, these eight spots are just what the doctor ordered. This Cobble Hill nook has everything we need in a local spot: date-night vibes, an extensive selection of vino (try Vinho Verde Roso, a sparkling red), a seasonal menu that hits on all of our keywords (ricotta, kale, figs) and a lovely back patio for warmer nights. This East Village watering hole manages to fit a lot into its petite digs: a well-curated wine list, a daily-changing menu (plus $5 happy-hour snacks) and ridiculously friendly bartenders. We just found our new favorite after-work spot. Can’t swing a retreat to a cozy Catskills cabin this winter? No problem. Just head to this delightfully rustic gem and you’ll find a roaring fire, tasty charcuterie and $7 house wine. Oh, and two words: Fondue Tuesdays. This LES mainstay is one of our go-to spots for a reason: It has a killer happy hour with $1 oysters and $15 wine carafes all day until 7 p.m. If you’re looking for something a little more substantial, the tapas menu should do the trick. We’ve been fans of this irreverent wine haven since its first location in the East Village, and it’s still one of our faves for its eclectic pours (entertainingly explained on the menu) and A+ bar snacks. It’s no secret that we adore everything French, so these two charming spots (one under the High Line, one on the UES) feed our little Francophile heart. It goes without saying that the wine—with 40 options by the glass—and cheese are plentiful.